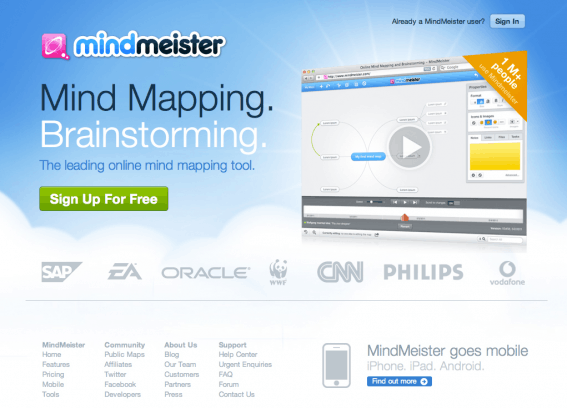 Mindmeister is a free mind mapping tool, which allows students to co-create and co-edit mind maps. MindMeister is suitable primarily for use in the polyphonic form of teaching. Within the polyphonic form of teaching it is obvious to use MindMeister as students' common mind maps, for generating ideas prior to common writing assignments, project work and similar tasks. Students can, simultaneously, enroll their ideas in the mindmap and they can comment on and build on each other's ideas in real-time, and the teacher also has the ability to read and participate in the evolvement of ideas. An online mind map can also serve as a tool to manage the collaboration process between a group of students. By the help of Mindmeisters 'history' feature, which allows you to see how a mind map has evolved since it's creation, it can also be used as students' documentation of their idea-generation and collaborative process. MindMeister is available in a free version, that you can access here. If you would like to try Mindmeister without registering, you can follow this link.